Why do some psychiatric patients fail to get better, even when in the care of competent clinicians? Treatment-refractory conditions are all too common in everyday clinical practice. Treatment resistance occurs across the full spectrum of psychiatric disorders, incurring enormous emotional, economic, and social costs. In the United States, treatment of depression alone costs more than $40 billion annually, and as many as 40% of patients with depression have a treatment-refractory form of the illness. This groundbreaking clinical guide starts where standard textbooks end, focusing on clinical strategies to be used after all basic treatment options, such as medication and psychotherapy, have failed. 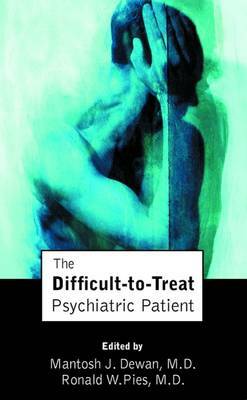 In this book expert contributors address the sequential clinical steps in treating difficult-to-treat psychiatric patients by offering a blend of evidence-based clinical recommendations, detailed case vignettes, treatment algorithms, and -- when necessary to go beyond the reach of evidence -- the clinical wisdom of leaders in the field. The chapters in this user-friendly, practical guide are organized by major disorder. Each chapter offers concrete recommendations on what to do when the usual first steps in therapy are ineffective, including evidence for biopsychosocial treatments alone versus in combination, generic versus specific therapies, and literature reviews and the latest expert wisdom. A sampling includes The management of the complex and often refractory bipolar disorder, which involves replacing or combining lithium treatment with anticonvulsants or atypical antipsychotic agents with adjuncts such as benzodiazepines, thyroid hormone, and electroconvulsive therapy, but also -- above all -- with careful attention to the therapeutic alliance. The importance of combined therapeutic modalities for patients with schizophrenia -- especially given managed care's cost-cutting strategies, which deprive many schizophrenic patients of effective treatment modalities such as family therapy or early use of an atypical antipsychotic. Combination treatments for anxiety, with medications adjusted over time as symptoms wax and wane, and early and appropriate interventions to mitigate internal and external environmental stressors. The emphasis on common sense, optimism, a sense of humor, and an iron constitution as the most important tools for clinicians wishing to work with the most severely ill patients with borderline personality disorder. The importance of individual differences in biological vulnerability, emotionality and expressiveness, cognitive schemas and beliefs, prior traumatic experience, resilience, and coping strategies for successful treatment of posttraumatic stress disorder. Packed with up-to-date information of immediate relevance, this volume will prove invaluable in both classroom and clinical practice, for everyone from beginning interns and residents to experienced psychiatric and medical practitioners and social workers.